When your extreme couponing leads you to take out a $30,000 insurance policy on your mustard, well, you might just have a hoarding problem. Many couponers feel offended by the Extreme Couponing show because it tends to portray couponing in a negative light. The people clipping coupons come across mostly as greedy. They buy hundreds of candy bars, clear shelves and hoard floor to ceiling stacks of products that they don’t even like. If you have seen the show, you know exactly what I am talking about: the family who doesn’t eat croutons but has more stock of them than the local grocery store, the lady with enough steak sauce to keep a busy restaurant in business for at least a month, and yes, that sea of that mustard that no one in the family will eat. You can get giddy sometimes when you are getting good deals and free products. it happens to the best of us. It is hard to turn down something for free. For some, it is a good feeling to visit your stockpile and marvel at its wealth. But there are also many consequences of hoarding, from changes in your family dynamic, to earning the resentment of others. And yes, there are extra monetary costs involved with hoarding, from storage space to that insurance policy. Does that mean that we should never stockpile? Of course not. 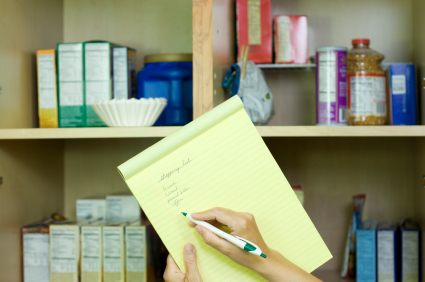 Stockpiling can be a valuable tool to keeping your grocery bill down week to week. By buying things on sale and with coupons, you’ll always pay the lowest price (or get it free). The key here is to have a reasonable stockpile without crossing over into hoarding. How can you create a basic stockpile without going all extreme? Well, most sales cycles rotate about every three months. There are some exceptions, such as seasonal items, but those are the basics. When you find a good sale, stock up on enough supply to last your family for three months, that is all. Another sale or deal will come along by the time you need to replenish, and usually it is an even better one. Your groceries will remain fresh, and you won’t have to toss things that are long expired. Good items to stockpile are those that don’t expire anyway, such as toilet paper and shampoo, but even these items can degrade, so stockpiling 25 years worth of deodorant just doesn’t make sense. There may be a little trial and error at first as you figure out how long certain items last in your household. How quickly do you go through a box of cereal, for example? Keep a running list of how many of which type of item you really need. I know that when pasta hits 50 cents or less per box, I should purchase enough to bring my stockpile up to 20 boxes. You also may find that the more you have of an item, the more you consume, so this is another reason to limit the stockpile. I know that when I buy regular bags of snack chips versus the big warehouse bags, we don’t seem to consume as many chips and don’t feel a sacrifice. Try to schedule consumption of certain items, so you neither get sick of them nor use them up before the next sale. For freezer stockpiling, you may find it useful to keep a list of everything in your freezer, so you can easily know what you have on hand and avoid forgetting to use some of your stockpile. By keeping your stockpile reasonable, you get the benefits of saving money on your groceries without all of the negatives associated with hoarding.